Uncertainty in Wastewater Treatment Design and Operation aims to facilitate the transition of the wastewater profession to the probabilistic use of simulators with the associated benefits of being better able to take advantage of opportunities and manage risk. There is a paradigm shift taking place in the design and operation of treatment plants in the water industry. The market is currently in transition to use modelling and simulation while still using conventional heuristic guidelines (safety factors). Key reasons for transition include: wastewater treatment simulation software advancements; stricter effluent requirements that cannot be designed for using traditional approaches, and increased pressure for more efficient designs (including energy efficiency, green house gas emissions control). There is increasing consensus among wastewater professionals that the performance of plants and the predictive power of their models (degree of uncertainty) is a critical component of plant design and operation. However, models and simulators used by designers and operators do not incorporate methods for the evaluation of uncertainty associated with each design. Thus, engineers often combine safety factors with simulation results in an arbitrary way based on designer 'experience'. Furthermore, there is not an accepted methodology (outside modelling) that translates uncertainty to assumed opportunity or risk and how it is distributed among consultants/contractors and owners. 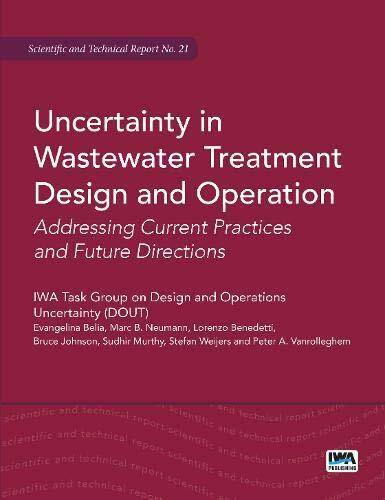 Uncertainty in Wastewater Treatment Design and Operation documents how uncertainty, opportunity and risk are currently handled in the wastewater treatment practice by consultants, utilities and regulators. The book provides a useful set of terms and definitions relating to uncertainty and promotes an understanding of the issues and terms involved. It identifies the sources of uncertainty in different project phases and presents a critical review of the available methods. Real-world examples are selected to illustrate where and when sources of uncertainty are introduced and how models are implemented and used in design projects and in operational optimisation. Uncertainty in Wastewater Treatment Design and Operation defines the developments required to provide improved procedures and tools to implement uncertainty and risk evaluations in projects.